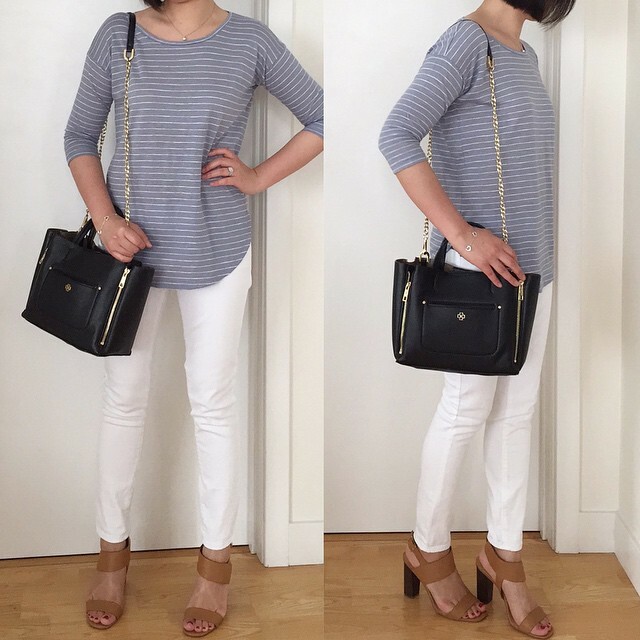 I finally got my hands on this striped shirttail tee from Ann Taylor and I love how size XXSP fits even though it’s still oversized. I was originally going to order the smallest size but someone mentioned that the sleeves were too tight but it fits me comfortably. The top is sold out online in petites but I bookmarked it since sizes do pop back in stock from time to time and finally got it on final sale for less than $12. 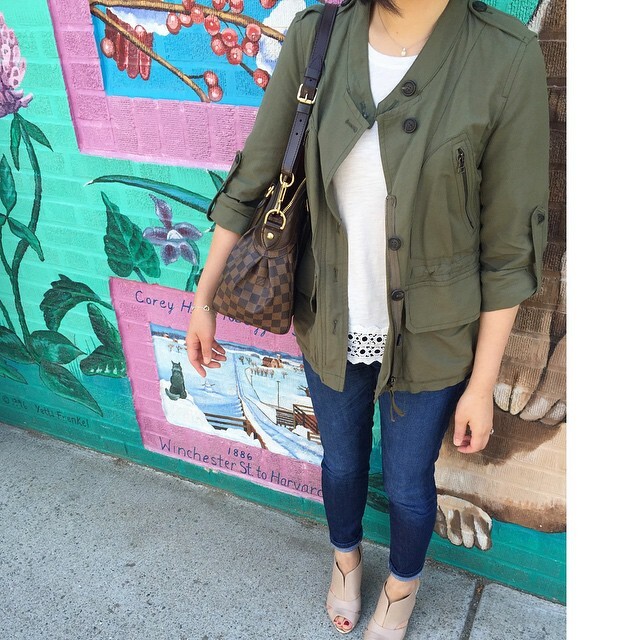 LOFT – Get 40% off EVERYTHING and extra 40% off sale styles. Lou & Grey exclusions apply. Valid in stores and online. Since no code is needed use the stackable code INSIDER538 online for an additional 25% off full-price purchases of $100+. That’s 55% off full-price styles after discounts! Update 6/21: Get 40% off full-price styles and an extra 60% off sale styles at LOFT with code FLASH. Lou & Grey exclusions apply. Online only. Sale ends 6/22 10AM ET. I may not be able to blog as frequently as LOFT changes their sales so please refer to this page for the latest sale alerts and coupon codes. I finally pulled the trigger on the fluid tee (review here) from LOFT in three colors and the floral swing shell (see size XS regular on me here) recommended by my friend Loan. I also ordered the tech stretch skinny ankle pants in the Marisa Fit to try. I love the striped shirttail tank dress (see it on me here and here, review here) so I ordered the solid version of the shirttail tank dress in XXS regular in black since petites was all sold out. I also managed to snag size XSP of my favorite cropped cotton cardigan in strawberry ice since I get a lot of wear out of the whisper white and morning aqua colors. 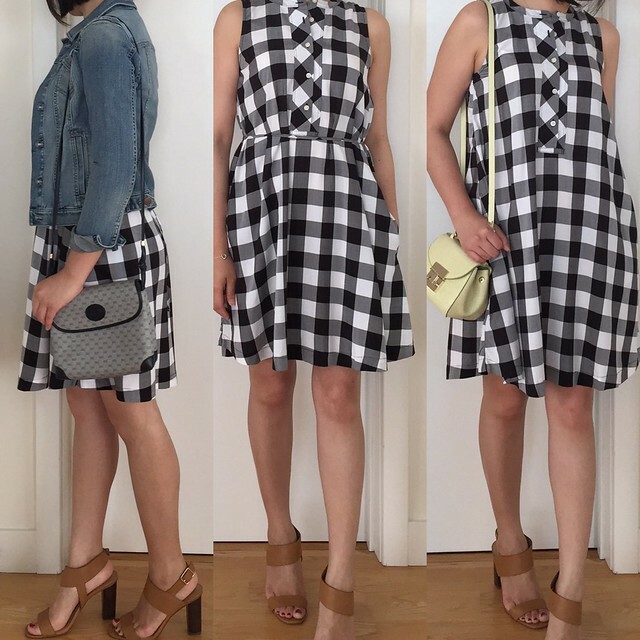 Update 6/21: I finally received this gingham gamine dress in size XXS regular and the arm holes are the right size and the dress fit me decently. I usually don’t like belting dresses on me but in this case I prefer the belted look because it runs large width-wise so it’s very shapeless and unflattering from the back when unbelted. I thought I would love this dress more but I personally prefer solids, stripes and polka dots. I’d probably wear the dress only a few times for the sheer novelty of it so it’s not enough reason for me to keep it if it isn’t a closet staple. I also got this graphic sweater in size S from Ann Taylor for $24 after trying on size M in store (as seen in this post). 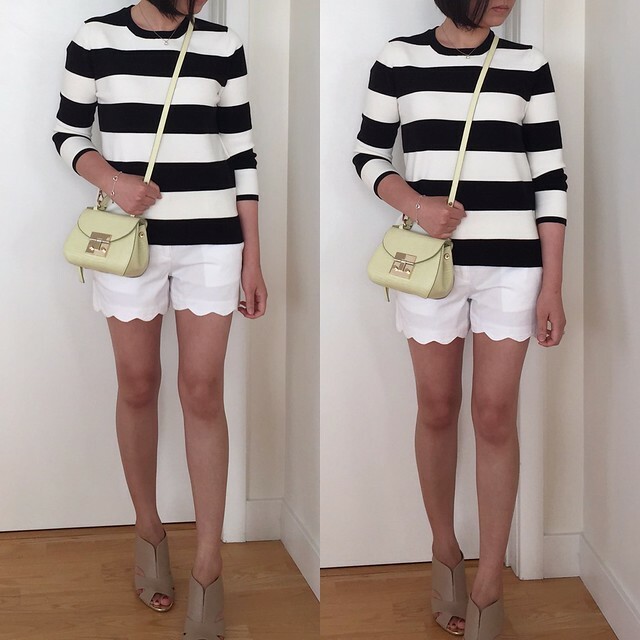 I love the Parisian inspired looks you can create with this sweater and it’s thick enough to wear all year round or on cool spring and summer nights.